Once you've built a website, you will surely want to know who is visiting and what they are doing when browsing on your site. Market insights are crucial to operations, development and growth. Web-Conceptions assist in implementing the right tools to track and monitor website traffic and KPIs, presenting comprehensive reports back to stakeholders in an easy-to-follow and visual manner, as well as available online anytime at your own convenience 24 hours, 7 days a week. Real-time website traffic trends. The purpose is to help you easily understand website visitors and their browsing behaviours, so you can then make relevant decisions and actions in order to become more successful online, i.e. improve SEO, boost online presence, and increase conversion rates. Free service: This is a completely FREE service - as long as your website does not start to generate over 9,000 pageloads each day, otherwise it will be deemed to be outside what the service can sustain as a free business model and you will be asked you to either remove the service or upgrade to a paying level (which also however gives you a lot more benefits and insights). Although 9,000 pageloads per day is a lot! 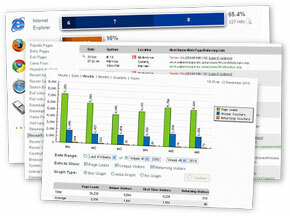 Plus many more available statistics & analytical web data, presented with graphs, tables & links. Please note, this service is provided by a third party reliable partner, in operation since 1999. Web-Conceptions also implement Google Analytics and Google Webmaster tools for our web development and search engine optimisation phase.